"The perfection of white does not lie in its untouched, pristine and innocent nature. 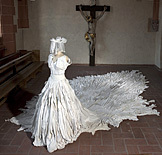 Nöle Giulini is a German artist born in Heidelberg, Germany. 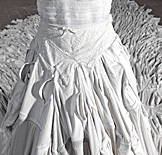 She currently lives and works in the Northwestern United States. By using materials like rabbit droppings, rotten fruit, banana peels, second- hand underwear, holey socks, old wool clothing and Kombucha Culture Nöle examines and then questions our system of values. The idea that opposites such as good and bad or our perceptions of ugly and beautiful exclude each other, and are therefore separate from one another, is challenged. There is no separation between the mind, the heart and the hands. No separation between thinking, feeling and doing. "I don't use material to talk about something. Material speaks for itself." 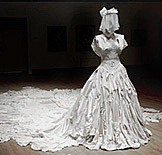 Nöle has shown her work widely in the United States. 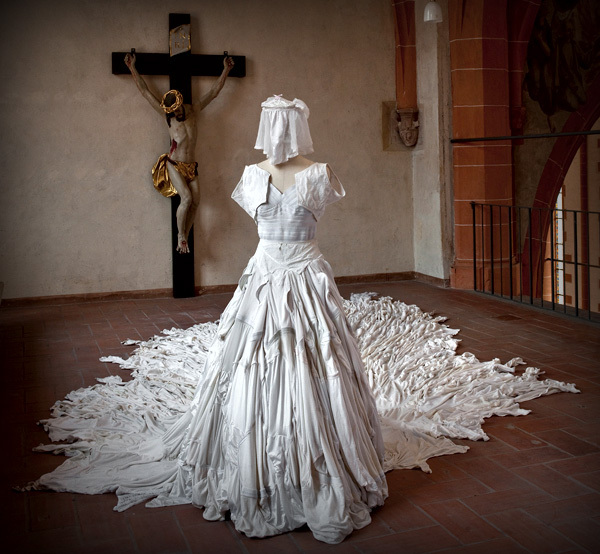 Currently her Weddingdress and several Kombucha objects are traveling through Germany in a group exhibition called Arte Sustenibile, curated by Samuel Fleiner.